The 600MW Kriegers Flak offshore wind farm is being developed approximately 15km east of the Danish coast in Baltic Sea. Image: courtesy of ABB. The offshore project is expected to start power generation in 2020. Image: courtesy of ABB. ABB is the supplier of an alternating current (AC) cable system, which will be used to integrate and transmit power from the Kriegers Flak offshore wind farm to the mainland grid. Image: courtesy of ABB. A 600MW offshore wind farm, which would be the world’s second biggest offshore wind farm upon completion, is planned to be developed in Kriegers Flak, approximately 15km east of the Danish coast in the southern part of the Baltic Sea. 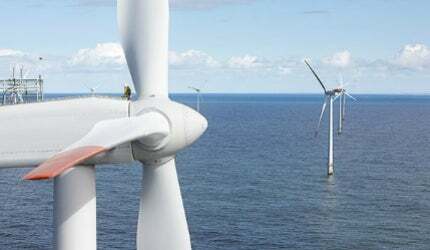 It is expected to surpass the 400MW Anholt wind farm, Dernmark’s biggest offshore wind farm by capacity. The project will be located in the waters between Denmark’s Møn region, Southern Sweden and Northern Germany. It is expected to have a lifespan of approximately 25 years, and will generate enough energy to supply more than 600,000 households. The kr3.5bn (approximately $513m) project is backed by the European Union with €150m ($164m) financing under the European Economic Recovery Programme. Cable laying works of the project are expected to begin in autumn 2016 and the grid connection works are slated for completion by the end of 2018, while first power is expected in 2020. Danish national transmission operator Energinet.dk, Germany’s 50 Hertz (formerly Vattenfall Europe Transmission), and Sweden’s Svenska Kraftnät partnered to develop a unique offshore electricity grid (common grid solution) in the Kriegers Flak region. The common grid solution will be the world’s first international offshore power grid, which will use cables to exchange electricity between Denmark, Sweden, and Germany. The grid project includes construction of three offshore wind farms in the waters owned by the respective countries, that will connected to the common grid. The 600MW Kriegers Flak wind farm will act as a Supergrid, which will supply renewable energy through the power grids to all the three countries. Germany is constructing the 288MW Baltic offshore wind farm 2 in the Kriegers Flak area, approximately 32km north of the island of Rügen, as part of the project. "The turbine model to be used for the project is not yet finalised, but is expected to have a capacity ranging between 3MW and 10MW." The Kriegers Flak wind project received final investment approvals from the Danish Minister for Climate, Energy and Building in December 2014. The Danish Energy Agency’s Offshore Wind Turbine Committee selected an area covering 180km² in the Baltic Sea in the Danish part of Kriegers Flak in 2010. The turbine model to be used for the project is not yet finalised, but is expected to have a capacity ranging between 3MW and 10MW. The wind farm is expected to include 60 to 100 turbines that have a height of 220m each and generate power at wind speeds between 3m/s and 5m/s. Each turbine will comprise a tubular tower and three blades attached to a nacelle that houses a generator, a gearbox, and other operating equipment. The wind farm is proposed to be coupled with the under-construction Baltic 2 wind farm in Germany. "Two offshore transformer platforms, spaced approximately 11km from each other, will be installed to step-up the electricity generated by the wind turbines to 220kV." Two offshore transformer platforms, spaced approximately 11km from each other, will be installed to step-up the electricity generated by the wind turbines to 220kV. From each of the platforms, an approximately 45km-long, 220kV submarine cable will be laid to the coast at Rødvig on Stevns. The submarine cables will be jetted into the seabed to protect them from fishing tools. A converter facility will be built at Energinet.dk’s substation at Ishøj to convert the AC current into DC and vice versa. The substation will transmit the power to the Danish electricity grid and out of Denmark when the offshore power grid is used to export electricity from Denmark to Germany. For the German part, the power generated by the Baltic 2 wind farm will be collected by the transformer platforms and transmitted to the Bentwisch substation. Underground cables will further transmit the power from Bentwisch to the existing transformer substation at Güstrow. Major construction works will include the installation of wind turbines foundations, HVAC platforms, offshore cabling, and substations. The wind turbine foundations will comprise a steel monopile with concrete gravity-base, jacket-type foundations, and suction buckets. The HVAC platforms are expected to have a length between 35m and 40m and a width between 25m and 30m. ABB was awarded a contract worth more than $100m for the installation of an AC cable system to integrate and transmit power from the Kriegers Flak offshore wind farm to the mainland grid. The contractual scope includes design, supply and installation of approximately 100km-long high-voltage, AC, three-core submarine cables. LS Cable and System was contracted to deliver approximately 95km of 220kV cables to connect the offshore wind turbines to Bjæverskov and Ishøj substations. Nexans was awarded the contract to deliver approximately 20km of 400kV cables, which will be used to reinforce the power grid between the Ishøj substation and the Hovegaard substation near Ballerup. NIRAS prepared the environmental impact assessment report and conducted environmental studies for the offshore wind farm.